As we find new information, it is time to implement it. When we found that Gaston say you use grey clothes in winterhunting, as we wrote about here, we had better make ourself some grey clothing. For us this is what reenacting is about. When you find new information you need to upgrade your kit to reflect this. Otherwise…. what is the point of research? This article is about the use of research and the first one literally written by both of us together. We wanted to share an example of how you can go about to interpret the material you have, how to think around your sources to reconstruct a believable garment. You will never be spot on, so it is always good to know HOW you think as you do and WHY. For us the interpretation is often based on how the garment falls around the body in the picture. This will give some clues to what kind of textile, how it is cut and what seams that are used. Many people look at the pictures, but don’t really see them. They have a illustration of a person from the age, but they do not see things that they do not already ‘know’ they wore. Another common thing is to explain everything that don’t fit into your picture of the age is to call it ‘artistic freedom’ on the illuminators part, even if it appears in several pictures and from different artists. Another trend in reecreating is going fancy. Sure, you like to have the tight cottehardi with fifty-eleven buttons. Sure, they where high fashion at the time. But what is the type of character you are actually wearing? Many have very simple cottes, especially when doing manual labour. Not to say that the manybuttoned cottes are not used here also, but how many reenactors dare to make the simple cotte today? Or to renounce from wearing all the nice stuff they have accumulated over the years? We are the same here, we like to use the nice things also. But we feel in our hearts that we should show the simple and common as well. We scoured our homes after fitting textile, and the books after fitting clothing. Granted, the climate in the books might not be the same as we have. The books are written in France, and Gaston himself lived in Occitania. I don’t really know how winter down there is, but there might be a difference from Scandinavian winters in cold and snow-depth. The cloth is not very thick though, as we see the garments mostly as a over-garment for functionality. The layer principle is at work here, and our experience tells us that you don’t need thick clothing when moving around in the winter forest. 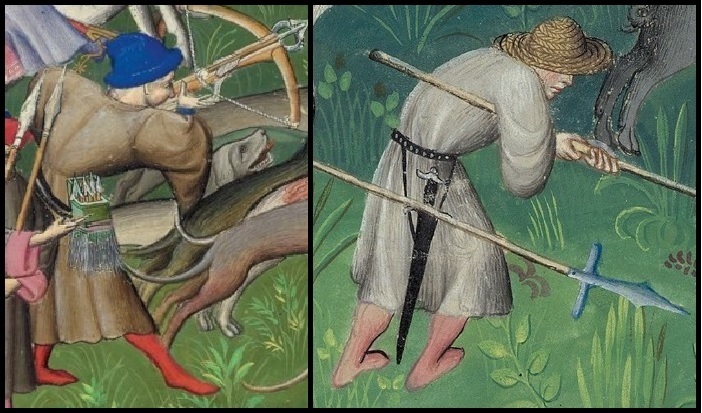 My kyrtil is partly inspired by two pictures of boarhunters from Livre de chasse, the Morgan library version, folio 83 and folio 84. On both pictures, most hunters wear greyish clothing, so I assume it is a winter hunt. 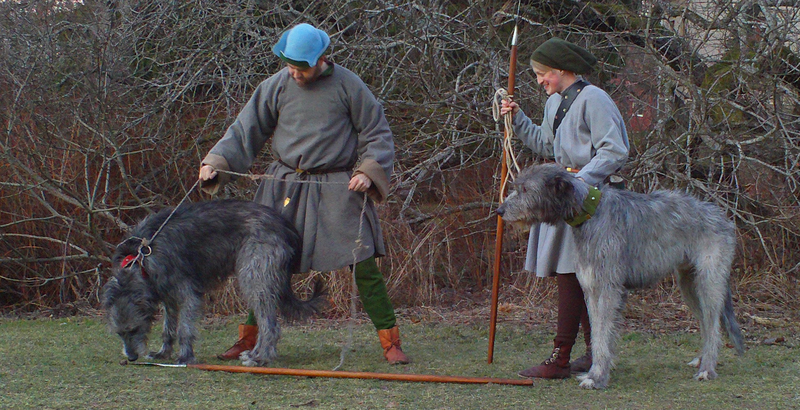 Both kyrtils are of calf length and very wide, loose-fitting. F 83 (left) has a delicately cut S-curved shoulder seam, almost like a grand assiette. It features a puffy sleeve, seemingly cut at an angle by the elbow, possibly also with a narrow cuff making it tighter over the wrist (it doesn’t really show but is an assumption based on my interpretation of how the fabric falls when the hunter is aiming with his crossbow). If F 84 (right) was thought to depict a garment of a similar cut is hard to know, it looks a little simpler, without the grand assiette and it could have another type of baggy sleeve with less fabric in it. Still, they are much alike and on both pictures I notice that the grey fabric folds and drapes very nicely against the belt. That makes me think of an ingenious cut that I’ve seen on preserved 14th century kirtles from Herlofsnes, Greenland. As none of the pictures show the front of the garment or the cut of it in detail, I decided to combine them with an archaeological find in my interpretation. From Herjolfsnes there is a wide kirtle known as Norlund 63. I think it appears to be much similar in cut and drape to those depicted in Livre de chasse and it is also contemporary with them. Norlund 63 is characterised by its loose fit and baggy S-cut uppe r sleeves with a narrow cuff over the wrist. The most obvious difference to the kirtles of Livre de chasse is that this one has a small standing collar and that it buttons down front with 16 cloth buttons. I went for just a handful of buttons as I don’t need more. In Livre de chasse it is more common to have just a few, rather than a full button row down the front. I really like the collar and as collars appear on other kyrtils from the same manuscript, I decided to keep it. 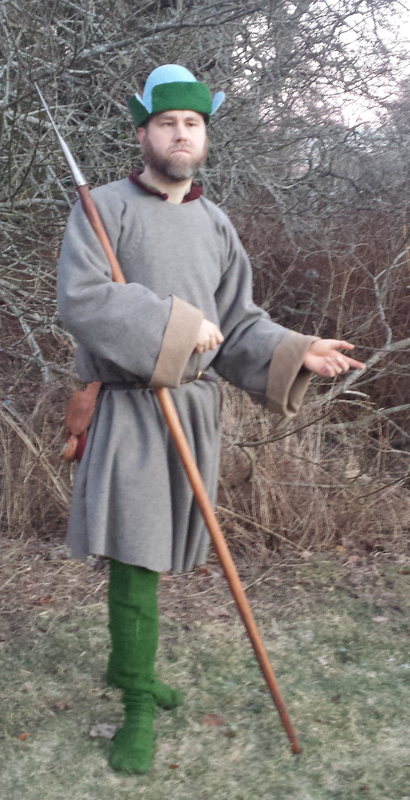 All in all, my winter kirtle is far more based on the archaeological find rather than the pictures from Livre de chasse, but I think it is a fair interpretation as they all are contemporary and of a similar cut. I found a loose garment in the same book (Folio 83v. ), a jaunty loiterer mostly chewing the fat with the other hunters down in the corner. 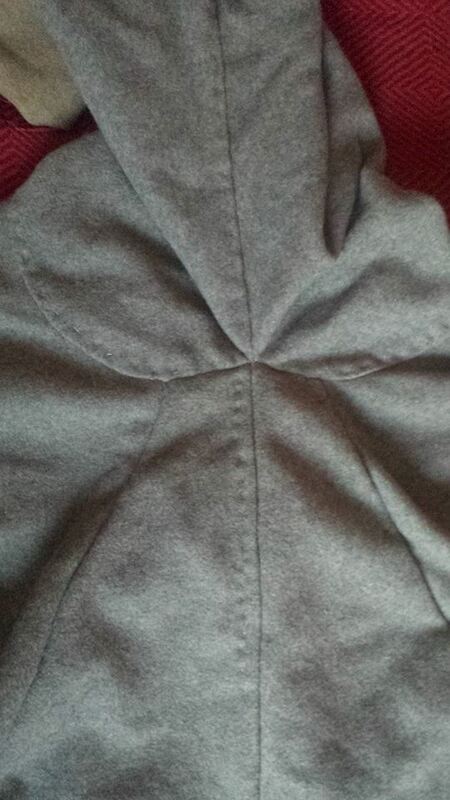 As the cloth I found at home was double-sided, grey and light brown, it seemed like a nice fitting garment. The scene is a boarhunt at winter and all hunters wear shades of grey. I thought the garment was probably very simple and loose. The arms looked straight and I could see no collar. While it was possible it had an opening at the front, I did not think it had one, based on the thought of the simple garment. To get width over the torso but not over the shoulders, I extended the gores in the sides up to the arm-opening. 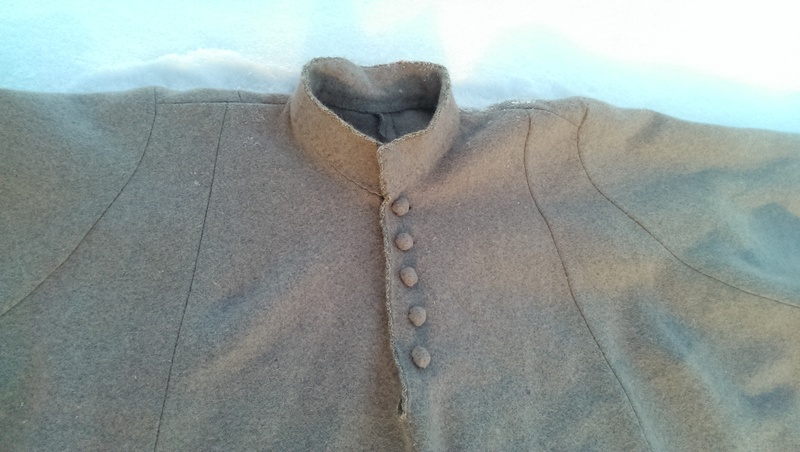 Based on most cottes construction at the time, I used grand (or grandish..) assietes for the armholes. This is also for the freedom of movement. Grand assietes is superior in matters of movement in a garment. The seam of the arm was left on the underside of the arm though, not on the back as is more common. Perhaps a rear-centred seam would have been a better choice, but I choose the underarm variant to stay with the thought of the simple construction. The edges was left raw. As the weather was not really on our side we thought we’d just snap some photos of the kyrtils to get this article running. We found a grey tangle of brush, to show why grey might have been a smart move during the defoliage season. Most woods up where we live are evergreen fir, juniper and pine so green might work just as well at wintertime really… But staying true to the huntbooks we took our grey kyrtils out and posed up! Johan had a basic cotte under and another more loose on top. The grey came up ontop of that. It kept the warmth rather nice, don’t let the absence of snow fool you, it was a very chilly day. Judging from the picture the arms are longer then the arms of the man wearing it, and then turned up. This was a rather good feature as turning them down kept the warmth over the hands well enough. Emil had double layers of wool with his thin summer-cotte under the new heavy grey one. 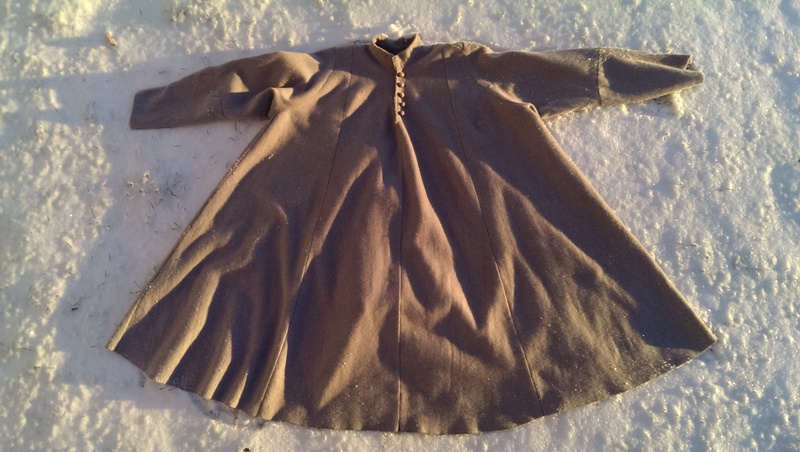 The generous cut of the new kirtle made the garment drape just like in the pictures. All the draping and folds of the fabric made little pockets of air, soon warmed by the body. When needing to regulate the warmth, it is easy to just undo a button or two. 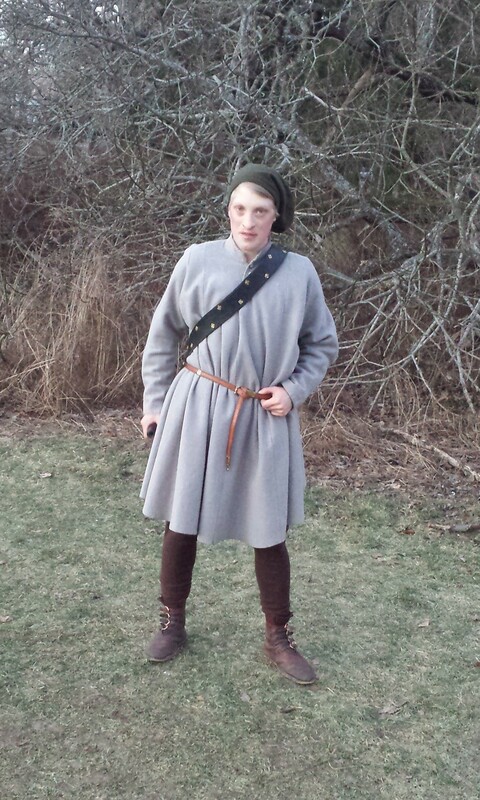 This entry was posted in Articles, Clothing and equipment and tagged livre de chasse, medieval winter, medieval winterclothing, Norlund 63, Recreating, reeneacting, research by johankaell. Bookmark the permalink.